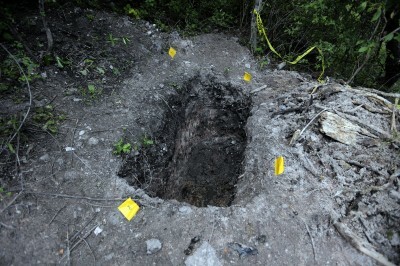 Civilians and nongovernmental organizations in Mexico found four more mass graves Sunday, as part of the search efforts to locate the 43 students from the Ayotzinapa Teacher Training College that went missing after being detained by Iguala police on the night of September 26. Since that date, more than 15 mass graves and dozens of bodies have been found. However, none of the remains found as of yet have been linked to the missing students. The most recent mass graves were found in La Laguna, just west of Iguala, the place where federal authorities say police officers shot at several buses that were transporting the students, killing three of them along with another three civilians, before handing over the survivors to a local gang. The nongovernmental organizations involved in the most recent discovering are now waiting for local authorities to arrive in order to start the forensic investigation. The alarming unearthing of numerous mass graves has raised considerable criticism towards local and federal authorities, who despite more than 50 days having passed since the students disappeared, cannot yet provide information or evidence on their fate. The situation has sparked outrage and protests across Mexico, with a significant portion of the society distrusting the Attorney General’s assertion that the students were killed and burned in a garbage dump. Federal authorities allege that the Iguala police handed the students to a local gang called United Warriors, who are said to have ties the former Mayor of Iguala, Jose Luis Abarca and his wife. The pair, who were recently captured by the police after weeks of hiding following the events in Iguala, are accused of being masterminding the attacks on the students who were on their way to protest an event that the Abarca’s wife was attending. Many protesters say the disappearance of the students is a state crime and are demanding the resignation of Mexican President Enrique Peña Nieto.